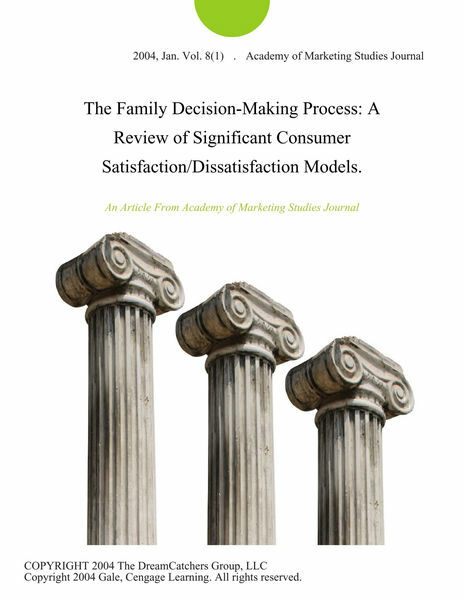 Download PDF The Family Decision-Making Process: A Review of Significant Consumer Satisfaction/Dissatisfaction Models. The Family Decision-Making Process: A Review of Significant Consumer Satisfaction/Dissatisfaction Models. ABSTRACT This paper discusses various models and theories in the family decision-making process concerning consumer satisfaction/dissatisfaction. This is of great importance because it is very possible that there may be some form of interaction between the satisfaction process and the decision-making context. The literature on family decision-making is also reviewed. Author by : Charles W. Lamb, Jr.